Funko Buffalo Soldier Bob Marley Wacky Wobbler Bobble Head - Hard to find! 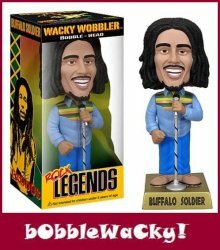 MyMovieMonsters.com > Bobbles-Vinyl > Funko > Wacky Wobblers Bobble-Heads > Funko Buffalo Soldier Bob Marley Wacky Wobbler Bobble Head - Hard to find! bObbleWaCky! presents...Funko "Buffalo Soldier" Bob Marley Wacky Wobbler Bobble Head, featuring the reggae rasta legend! Very hard to find! Straight from back stage comes Bob Marley in a laid back, limited edition bobble head that stands about 7" tall. Collectors Note: Brand-new and comes in window-box packaging for easy display. Collect all the Rock Legends!